If you want to go searching for one shiny wet nose this half term then get through the swishy swashy grass to Belgrade Theatre in Coventry and clamber aboard the adventure. 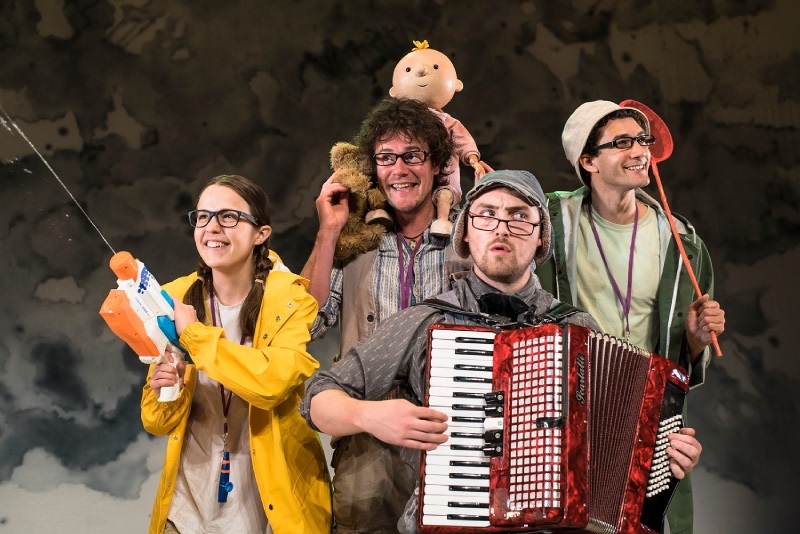 We’re Going On A Bear Hunt, written by Michael Rosen and illustrated by Helen Oxenbury, has just finished a West-End and international tour and been brought to stage by director Sally Cookson’s lively adaptation. It’s everything a family show should be with thrills, spills, scares, toilet humour and was all singing and dancing. The atmosphere was electric and children loved to be soaked by water guns and great audience participation made the hour-long show simply fly by. The vivid and noisy show was brilliantly accompanied by Benji Bower’s versatile lively score with extremely catchy songs to take the story through long wavy grass until the deep dark cave with a variety of instruments from a melodica to an accordion to shaking maracas. Paper butterflies were handed out and the actors were bursting with enthusiasm to get to the river. By far the best bit of the show with juggling blue buckets filled with water, wiggling bottoms and even some gymnastics thrown in with the splits. Super grans, yummy mummies and dishy daddies were in stitches at the antics and the fast-paced storyline with everyone being splashed along the way as water fired out of water pistols and super soakers. When it came to the mud there were farty noises and lots of classic ‘It’s behind you!’ shouts and scary rumbles as the family became ever closer to the furry bear awaiting them in a very dark and frightening cave. In the forest the dog Buddy rolls in some bear poo with some shouts of disgust before they finally make it with baby in a backpack to the main event. The bear thankfully was a huge fluffy friendly bear that chases them all the way back home where the baby has to pick the lock to let the dad back into the house. Thoroughly enjoyed the tale which was so brightly bursting with fun to bring the fabulous book we all know and love to life in this crazy energetic production.